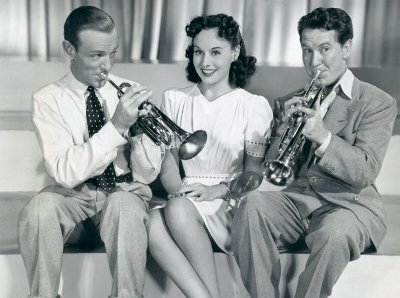 Danny O’Neill (Astaire) and Hank Taylor (Meredith) are seventh year college students who flunk on purpose to continue playing the trumpet in their college jazz band. They meet Ellen Miller (Goddard) who becomes their manager for the band. 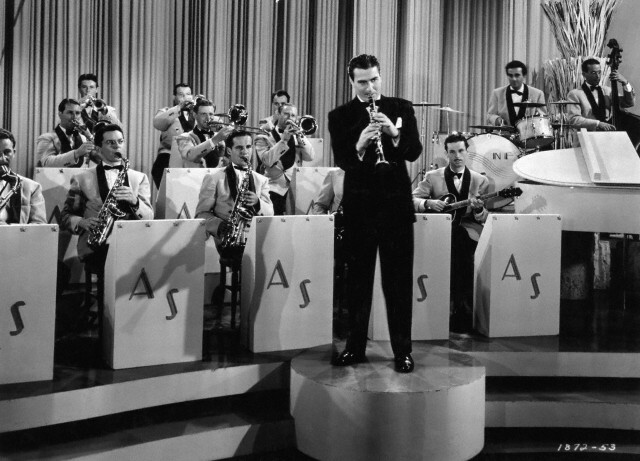 And when band leader Artie Shaw (as himself) hires Ellen, Danny and Hank scheme and double cross each other to get into Shaw’s band. -Astaire and Meredith are both supposed to be college students. Though they were supposed to be in college for seven years, they were both much too old to be students. Astaire was 41 and Meredith was 33. -Meredith and Goddard were married at one time, but no during this film. The two actors didn’t get married until 1944. -Billy Butterfield dubbed Meredith’s trumpet playing and Bobby Hackett dubbed Astaire’s. If you play a musical instrument or were ever in band, it’s pretty obvious that neither is playing. They are pretty terrible at faking it. -No song really stands out, though you do get to hear Artie Shaw and his band perform several time. This is another example of having the opportunity to hear a popular band leader of that time period. -A good comedic moment for Goddard is when she talks to varying groups of people to sell the Astaire and Meredith’s bands. She talks to proper old women, thugs and teenagers-acting like she is one of them with each. -Astaire works in a Russian restaurant and plays in the restaurant band, dressed as a Cossack. 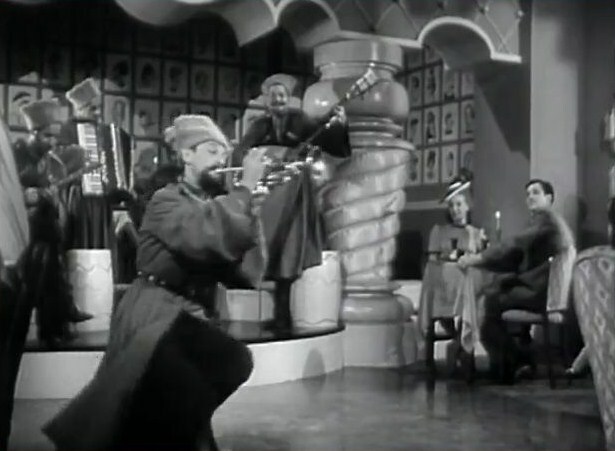 He does the Cossack dance while (pretending) to play the trumpet. 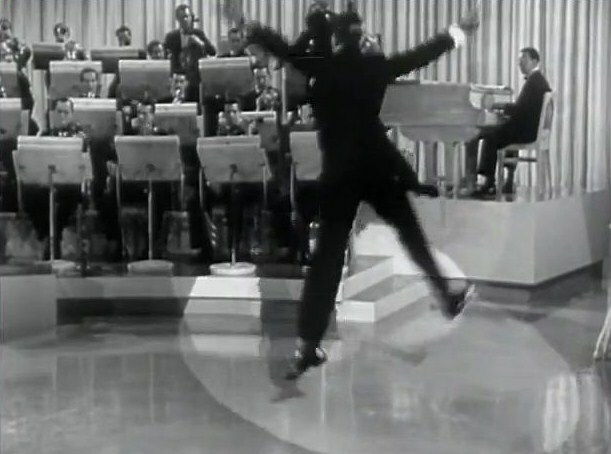 -The finale includes Astaire directing a band while tap dancing and eventually while tap dancing and playing the trumpet. Far-fetched but fairly entertaining. 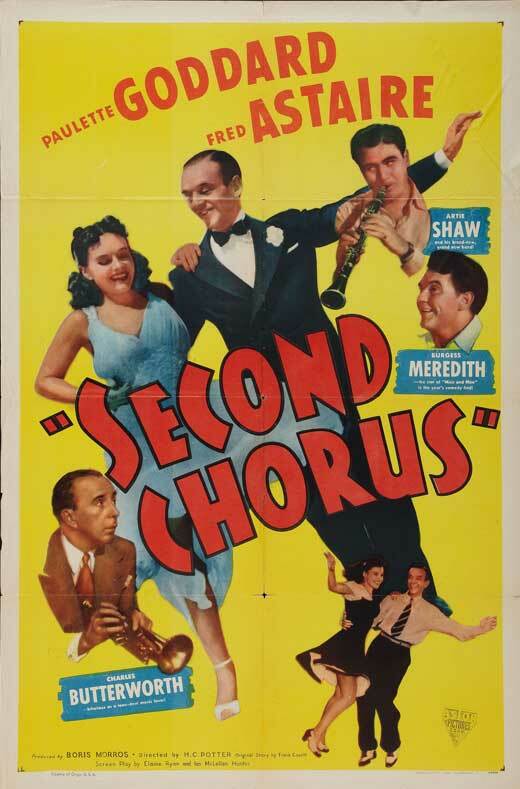 Also, for a Fred Astaire musical, he had far fewer musical numbers than usual and the film seemed more like a vehicle to highlight Artie Shaw and his band. The thing that bugged me the most were how badly Meredith and Astaire faked playing the trumpet. Bad form, puffing of cheeks, one hand playing. I guess that comes from being in the band for several years. Also, though Astaire and Meredith are good actors, I would say Paulette Goddard acted circles around them both and was the best part of the movie. This entry was posted in Musical Monday and tagged Artie Shaw, Burgess Meredith, fred astaire, Musical Mondays, Paulette Goddard, Second Chorus by Jnpickens. Bookmark the permalink. Paulette usually is the best part of a movie – but Fred & Burgess as college students? They must have been minding the music and not the books! I agree. Paulette was wonderful. I feel like when she is in a movie I don’t see her enough. Haha, actually their plan in the movie was to flunk as much as possible to stay in school! Can you imagine how expensive that would be now? Wish I could dance like Fred Astaire. Maybe in my next life, Jessica. I wish I could dance that well too, Dr. Timbs. Thank you for commenting and I hope all is well. Miss you! Paulette was actually a talented little dancer. She kept up with Fred quite well, much better than Fontaine in “Damsel in Distress!” For some reason I always feel like Paulette is overlooked. She was a great comedic actress, an above average hoofer and even could hold her own in dramatic parts. Sometimes I think with Fred it’s as if the studio was like, “Who haven’t we paired him with?” and that’s how they decided on his leading ladies. You know, as I rewatched this movie I remembered at one time she was a Ziegfeld Girl so her dancing didn’t seem as odd to me as it had in the past. I feel the dance they had her perform probably didn’t display her true talents. Surprising to me, I feel like Astaire didn’t get much of a chance to show his talent in this movie- seemed like it was more about Artie Shaw. I think you are right about how they teamed Fred with women. I now want to brain storm who his oddest pairing was. Maybe Fontaine. That is one horrible movie poster advertising the film! That drawing of Paulette is awful! Fred doesn’t look too good either. The side portrait of Meredith is pretty accurate looking, but the only one on that piece of movie art! It is, isn’t it? Sometimes the posters for movies make the stars look terrible. Check out the drawing of Betty Grable on “Moon Over Miami.” She looks really odd!